Basemaps provide background and context in support of a map's operational layers. They help to orient users. Aerial imagery, terrain layers, and street maps are often used as basemaps. In Essentials, a basemap can contain multiple map services. When a user selects a basemap in a viewer's Basemap Switcher, the map services in that basemap turn on and the map services in the other basemaps turn off. In addition to individual map services, a basemap can contain one sub-group of map services called a transparency slider group. Transparency slider groups present their map services in a slider that the user can drag to fade out one map service and fade in the next map service. Basemaps are configured on Manager's Basemaps page. You can configure as many basemaps as you want, and a basemap can contain as many map services as you want. Each basemap can contain at most one transparency slider group. A map service can belong to more than one basemap. To make a map service function as a basemap, you include the map service in at least one basemap on Manager's Basemaps page. Map services that are not included in a basemap are operational. ArcGIS Server feature layers, KML layers, and GeoRSS layers cannot be used in basemaps in Essentials. The Basemap Switcher provides a quick way for users to select a basemap to make visible. Selecting a basemap turns on the basemap's map services and turns off all other basemap services. When the Basemap Switcher is closed, it shows the currently selected basemap. In the Desktop and Tablet interfaces, the user clicks or taps the Basemap Switcher to open the Switcher and select a different basemap. In the following images, the Streets basemap is selected. In the Handheld interface, the user opens the I Want To menu, taps Select a Basemap to open the Switcher and select a different basemap. By default, the Basemap Switcher shows in the viewer whenever two or more (non-empty) basemaps are configured in the site. You can configure the Basemap Switcher to show when a single basemap is configured. If you include basemap services in the Layer List, then there are two ways for users to change the visibility of basemap services—by changing the visibility checkboxes in the Layer List, or by selecting a basemap in the Basemap Switcher. The Layer List and Basemap Switcher are synchronized. When a user selects a basemap in the Basemap Switcher, the basemap's map services turn on in the Layer List and the other basemap services turn off in the Layer List. Conversely, if the user uses the Layer List to turn on exactly those map services that make up a particular basemap (and turn off all other basemap services), then the Basemap Switcher updates to show the basemap that the user turned on in the Layer List. Any combination of visibilities that do not turn on exactly one basemap (for example, turning on map services from different basemaps, or turning on a subset of a basemap's map services) results in the Basemap Switcher displaying the default Basemaps icon. The default icon indicates that no single basemap is currently selected. Note that, to show a transparency slider, you must turn on exactly one of the map services in the slider group—the slider does not show when more than one of its map services are turned on in the Layer List. The particular basemaps that appear in the Basemap Switcher depend on the layer theme that is selected. If the built-in All Available Layers layer theme is selected, then the Basemap Switcher shows all the (non-empty) basemaps that are configured in the site. When a user selects a basemap in the Basemap Switcher, all of the map services in that basemap turn on, and all of the map services in all of the other basemaps turn off. When the user changes the layer theme, the basemaps that are available in the new layer theme are loaded into the Basemap Switcher, replacing the basemaps from the previous layer theme. A basemap is available in a layer theme if one or more of its map services is included in the layer theme. If all of a basemap's map services are excluded from a layer theme, then the basemap does not show in the Basemap Switcher. Basemaps can contain transparency slider groups. These are groups of related map services whose relative transparency is controlled by a slider. Dragging the slider fades out one map service (increases the transparency) and simultaneously fades in the next map service (decreases the transparency). This provides a smooth transition from one map service to the next. In the Handheld interface, the transparency slider only displays if the bottom panel is closed. For example, suppose you have aerial photographs of your town that were taken every two years between 2005 and 2011. You publish the aerial photographs in four map services called 2005, 2007, 2009, and 2011. In Essentials, you put the four map services in a transparency slider group and add the slider group to a basemap. When an end user selects the basemap that contains the slider group, the slider opens. In the screen capture, the 2009 map service is currently visible. If the user drags the slider to the right, 2009 starts to fade out and 2011 starts to fade in. 2011 becomes fully visible (0% transparency) at the same time that 2009's transparency reaches 100%. At this point, 2009's visibility checkbox is cleared. Transparency sliders have very little space to display the map service's names. For this reason, only the names of the first and last map service show in the slider. If you configure a map service's Short Display Name, the short name is used in transparency sliders. If a slider group's map services are in a folder and you set the visibility behavior to Only One Visible at a Time, the slider will snap from one map service to the next instead of transitioning smoothly. On the map service's Functional tab, set the Basemap Transparency Slider Group setting to the name of the slider group. To create a new slider group, type in the name. To select an existing group, click in the Basemap Transparency Slider Group box and select the group from the drop-down list. On the map service's Details tab, enter a Short Display Name for the map service (recommended). The short display name is used in the transparency slider. Change the map's drawing order so that the map services are in reverse order on the Map Services tab. Reading down the Map Services tab, the slider group's map services are in right-to-left order. Add the slider group to a basemap. When you remove all the map services from a basemap transparency slider group, the transparency group no longer exists in the site. In Manager, edit one of the map services that belong to the transparency slider group, and then click the Functional tab. Click in the Basemap Transparency Slider Group box and delete the name of the slider group. Repeat the above steps for each map service that is in the slider group. Map Services: Indicates which items are included in the basemap. A basemap can include any number of map services and at most one transparency slider group. To add an item to the basemap, select the item's checkbox. To exclude an item, clear the item's checkbox. The Map Services area lists every map service that can be used in a basemap. ArcGIS Server feature layers, KML layers, and GeoRSS layers cannot be used in basemaps. Display Name: The name that is used to refer to the basemap in viewers. The display name appears in the Basemap Switcher, so a short name is recommended. Icon URI: The URI for the icon that will represent the basemap in a viewer's Basemap Switcher. This setting is used to define custom offline basemaps, which are used by the Geocortex Mobile App Framework. The service that you configure in this setting is used to override the basemap's ExportTiles operation. For more information, see the Geocortex Mobile App Framework documentation on custom offline basemaps in Android, iOS, or Windows. This procedure adds a map service to the map and creates a basemap that contains the map service. Search or browse for the map service that you want to add. Select the Add as Basemap checkbox. The Add as Basemap checkbox appears when you have located the map service that you want to add. In Manager, edit the site that you want to configure, and then click Basemaps in the side panel. In the Map Services area, select the checkbox for each map service that you want to include in the basemap. You can also include one transparency slider group, if you have configured one. In the Display Name box, type a name for the basemap. The display name appears in a viewer's Basemap Switcher, so keep the name short. In the Icon URI box, type or paste the URI for the icon that will represent the basemap in the Basemap Switcher. In the Export Tiles Override box, you can optionally override the basemap's URL for the ExportTiles operation. This setting is used to define Custom Offline Basemaps, and is only available for basemaps containing at least one ArcGIS Tiled Service. The site must contain the overriding ArcGIS Tiled Service that supports the ExportTiles operation. For more information, see the Geocortex Mobile App Framework documentation on custom offline basemaps in Android, iOS, or Windows. In the list of basemaps, click the basemap that you want to edit, or hover the pointer over the basemap. If each map service in a particular basemap is turned on by default, and all other basemap services are turned off by default, then the basemap is selected in the Basemap Switcher when the viewer launches. You can use this fact to configure a default basemap. For example, the following screen capture shows how to configure the default visibility to make Basemap 1 the default. Clear the visibility checkbox for each map service that is not in the default basemap. Select the visibility checkbox for each map service that is in the default basemap, but is not in a transparency slider group. If the default basemap contains a transparency slider group, select the visibility for exactly one of the map services in the slider group. The map service that you select is the slider's default. 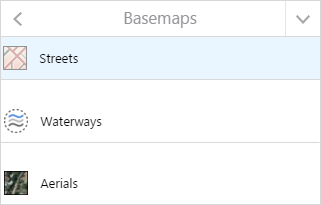 The order that basemaps appear on Essentials' Basemaps page determines the order that they appear in the Basemap Switcher. Top-to-bottom order in Manager corresponds to left-to-right order in the Basemap Switcher. Click the Collapse All icon at the top of the list of basemaps. Click the basemap that you want to appear left-most in the Basemap Switcher and drag it to the top of the list. As you drag the basemap, a marker shows you where the basemap will be placed when you release the mouse button. Continue dragging basemaps until they are ordered the way you want. Top-to-bottom in Manager appears left-to-right in the Basemap Switcher. In the list of basemaps, click the basemap that you want to remove, or hover the pointer over the basemap.